Compact bookshelf speakers are all well and good if you don't have much space, but for bigger, bolder home cinema thrills you've no choice but to make room for a decent set of floorstanders. While that would normally mean upping your budget, Teufel's new Columa 100 speaker system can be yours for a wallet-friendly price. Columa 100 is the baby of the range, which also includes the £490 Columa 300 and £1,060 Columa 900. 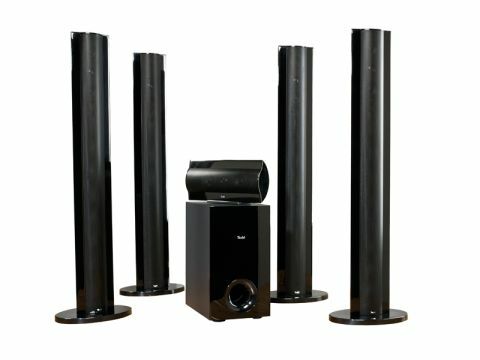 This set comprises four identical 109cm-high speakers for the fronts and rears, the CL 100 C centre and a powered sub that kicks out 100W of bass. If you get a last minute pang of guilt over how much space the columns are taking up, you can substitute the fronts, rears or both for shorter 35mm-high satellites. But we're going for the Full Monty column system here. The design of the titular columns is a break from the norm, thanks to the seductive gloss-black finish and a curvy back end that provides an elegance missing from some of Teufel's high-end speakers. At 8.6cm deep, they're a lot shallower than your average floorstanders, and when mounted on the oval bases they really are a sight for sore eyes. Don't expect the same tank-like build quality as Teufel's pricier packages, but at this price we're not complaining. On the back you'll find gold-plated binding posts, but their location inside a small recess makes it quite tricky to feed cables into the holes. Inside each column is a pair of all-new Klippel-optimised 2.75-inch mid-range drivers and a 0.75-inch tweeter, with an optimised crossover pulling the frequency strings. The same drivers can be found inside the CL 100 C centre. The best part of the sub is the front-mounted power button, which could be a blessing if it's installed with its back to the wall, although with Auto power on board you shouldn't need to use it. A couple of controls are provided on the back to get the sub singing in harmony with the other speakers – a volume dial and a switch that flips the phase 180 degrees. In action, Columa 100 delivers the sort of sound you'd expect for the money – an enthusiastic, detailed performance that warms the cockles, but can't muster the power, insight and evenness provided by sister systems. During Inception, the opening scenes are a riot of well-placed effects such as the crack of falling timber and the rush of flood water. But there's a hint of brightness behind some of these effects at loud volumes that betrays the budget price tag, such as the clink of shells discharging from a gun or glass hitting the floor as Ariadne smashes the mirror. It's better than the vast majority of all-in-one systems, but still unpolished. Meanwhile, the centre channel's dialogue handling is assured and easily cuts through busy action scenes, but the star of the show is the sub, which delivers the sort of punch and agility you'd expect in a much pricier package. With a bit of tweaking, it blends with the columns beautifully, working its magic without grabbing too much attention. And the rear speakers' ability to express subtle ambience and project louder effects creates an open, engaging rear soundfield. Columa 100 also has a keen ear for music, with a crisp, rhythmic presentation of CDs and SACDs. That, along with the generally enjoyable movie performance and good looks, makes Columa 100 well worth a look.